Celtefog is an outfit by Archøn, whom you might know as guitarist of Greek act Empathy. He started this project to play a more Pagan-oriented form of Extreme Metal, often helped out by his Empathy-colleague Wolfram as session drummer. I was quite pleased with 2015’s Deliverance, and after a split with the old schoolers of Hocus, Celtefog recorded a handful of new tracks during Winter 2015-2016, gathered as Sounds Of The Olden Days (and including a reinterpretation of an older piece). Those tracks, recorded with some guest / session musicians, are meant to be a therapeutically outlet, ‘composed under a total mystical and esoteric research’, based on Archøn’s childhood memories in order to ‘restore the faded smells’ of those olden days. 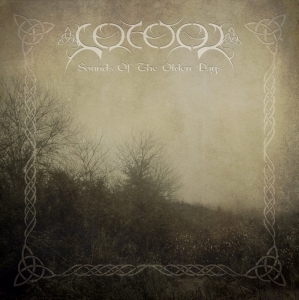 Sounds Of The Olden Days was initially released the digital way in very early 2016 via the project’s Bandcamp profile, and now it gets a proper distribution (somewhat sober yet beautiful digipack) thanks to Vegvisir Distribution. The album consists of six pretty lengthy tracks; the total running time comes close to fifty minutes. And it goes on where Deliverance came to its end. This stuff is quite guitar-based, with dual guitar leads as main force to create the characterising melancholy of the concept. The tempo is quite slow, and with the grim vocals included, there is a pronounced link with the DSBM-scene for sure. The intimacy of that melancholic atmosphere goes hand in hand with some Folk-oriented intermezzi. Guest musician Autolykos performs tradition instruments, such as the bendir (a hand drum), tin whistle (kind of flute) or Pontic lyra (like a lute), and these folkloristic parts often get ‘strengthened’ by acoustic guitar melodies and whispered voices. I think the interaction in between the folksy passages and the blackened parts comes in quite an organic way – not like an incoherent mixture of two different directions, but like a natural cohesion. Nice. The better part, however, is the Nordic-styled blackish one (you won’t hear me complain! ), with that slowed-down melancholic attitude at the one hand, as said before, and a harsher one too. Within the faster parts, the rhythmic drum patterns create a pounding, heavy pattern, continuously enriched by the different guitar layers. That’s a nice detail, I think, because it does not matter whether an excerpt is slow or fast: that melodious aspect typifies the core of Celtefog’s Black Metal. Excellent too are the fine bass lines, completing the full sound. Even though used as a background instrument, the attentive listener will surely appreciate the inherent presence of those four strings. And the blackish screams, well, what an abyssal throat. The barb-wired screams spit acid and sulphur without exaggeration, yet nicely dosed within the totality. The production, finally, is okay. Every instrument is hearable (too often, the bass lines disappear in a mishmash of sounds; not here, for it has been mixed professionally), and the dense sound supports the melancholic concept. Because of the many layers, it’s quite a ‘full’ experience, permanently arousing and revealing new elements.